How can you do and see more for less in Niagara Falls? Purchase an Ultimate Casino Experience package. In Canada, the betting and drinking age is 19. Crowne Plaza Fallsview: For decades, this elaborate Victorian jewel has been a traveler’s favorite. It provides everything for a delightful vacation from classic styling to modern amenities. Comfortable beds, Wi-Fi, indoor pool, whirlpool, and a shopping concourse are just the beginning. For scenery and service as fine as the gourmet Italian specialties, the vast windows surrounding the lavish Rainbow Room let you take in spectacular waterfall panoramas. You’ll appreciate indoor access to Casino Niagara, the three-acre Fallsview Indoor Waterpark, all Falls Avenue attractions, and diverse restaurants. Sheraton On The Falls: This towering haven ensures a premier location to the falls. Luxurious Fallsview accommodations with jetted bathtubs, two-story suites, and corner suites come with huge windows for sweeping waterfall views. Amenities include wireless internet and refrigerators as well as indoor and outdoor swimming pools. Enjoy meals at Windows by Jamie Kennedy and Fallsview Buffet. The Sheraton features direct connection via an indoor walkway to popular tourist attractions spanning from Fallsview Indoor Waterpark and Adventure City to Hershey’s Chocolate World. Other top sites like Hornblower Niagara Cruises are easy to access. Skyline Hotel: Unique lodging arrangements house larger families comfortably. Some single rooms offer the convenience of three queen-size beds. For fun sleepovers, Bunk Bed Suites accommodate up to six guests in two attached rooms. You’ll appreciate modern amenities from refrigerators to internet access. An indoor skywalk with climate control is the easy way to reach numerous Falls Avenue attractions, retailers, and eateries. Kids will love the Fallsview Indoor Waterpark. Iconic themed dining options range from Hard Rock Café with legendary music memorabilia to tropical-inspired Rainforest Café. Fallsview Casino is Canada’s largest gaming resort overlooks majestic Niagara Falls. This grand and elegant 2.5-million-square-foot casino boasts plenty of slot machines (over 3000), gaming tables (130 Baccarat, Blackjack, Roulette, Craps, Caribbean Stud, and others), and a poker room. Sample the impressive Galleria’s shops and restaurants like the Grand Buffet, 17 Noir, Canyon Creek Chophouse, Golden Lotus, Mama Mia’s!, Falls Deli, Subway, Tim Hortons, and Starbucks. Visit the intimate Avalon Theatre where famous music and comedy headliners perform, the amazing Dragonfly nightclub, R5 lounge, and Breeze Bar. 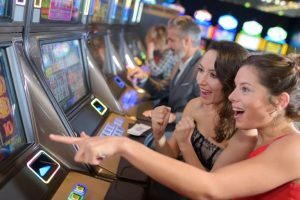 At Casino Niagara, enjoy this 95,000-square-foot players’ club with a newly renovated second level, slot machines including video poker (1300), table games (40 Blackjack, Roulette, Mississippi Stud, and more), poker room (26 tables), and new interactive Xbox and PlayStation games. Savor Casino Niagara’s Market Buffet, LEV2L Sports Bar, and Perks Café meals, snacks, and your favorite beverages. Spring Break Passport: March 9-April 8 escape provides $300 worth of fun with family-friendly attractions like Fallsview Indoor Waterpark. Waterpark Getaway: Fallsview Indoor Waterpark features 16 waterslides, a gigantic wave pool, and much more. Ultimate Couples Experience: Get romantic while dining, wine tasting, unwinding at a spa, and sipping cocktails. Niagara Winery Experience: Package includes transportation to four award-winning wineries for guided tours and wine tastings. Ultimate Spa Experience: Unite a relaxing couple’s massage at tranquil Christienne Fallsview Spa with dining, cocktails, and wine tastings. Niagara Culinary Experiences: Combining celebrity chefs with wineries creates tempting treats and sips for traveling gourmets. New Year’s Eve Packages: Various celebrations pair live music with fantastic fireworks displays. There are plenty of Niagara Falls packages and deals for the Fallsview Casino. No matter what time of year you are looking to travel, you can find accommodations that will make your trip to Niagara Falls one to remember. Book at any of one our properties today!